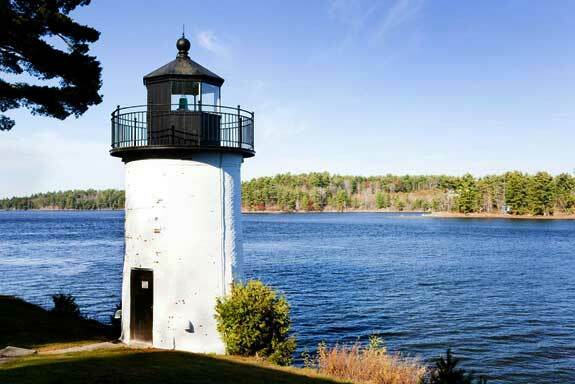 Whitlock Mills Lighthouse on the St. Croix River in Calais, Maine. The summercators began their annual pilgrimage to Maine in the 19th century. In that bygone era, few of these golden age vacationers made their way all the way to Calais. The same is true today. The Maine coast begins in Kittery and ends in Calais, and the state’s waterfront measures roughly 280-miles. On a good day, it will take you roughly 5 hours to get to Calais from Kittery. However, the beauty of Maine is not in finding the easiest and fastest trajectory from point A to point B. It is about exploring the countless nooks and crannies. It is about heading Downeast before continuing up north. When you finally make it to the border community of Calais and are staring across the St. Croix River at St. Stephen, New Brunswick, be sure you do not say Calais the way the French would. The International City of Maine is pronounced callous. Calais has a sleepy, old world vibe. The city is dotted with handsome coastal homes and gingerbread style Victorians. The brick Main Street is on the state’s Register of Historic Places, and the entire downtown is fanned out across a pleasant grid. Calais was settled in 1779. It was a prosperous lumbering center and then a successful shipbuilding port. The Liberty was launched from Calais in 1801, and from that moment on shipbuilding was the city’s powerhouse industry. Calais has had a long and close relationship with its Canadian neighbor, and this is celebrated every year at the International Homecoming Festival in August, which includes a lively street fair, fireworks and a parade. After its lumbering and shipbuilding heyday, Calais struggled economically in much of the 20th century. Today, the tourism industry in Calais has begun to surge like the tide. Up in this coastal corner of Maine, the tide can surge more than 30 feet, making it the greatest tidal change in the continental United States. If you stroll the 1.4-mile Calais Waterfront Walkway at the right time of day, you will have a chance to see this natural phenomenon. If not, you will at least be guaranteed a host of scenic vistas and a possible bald eagle sighting. The birds have numerous perches along the trail. The city has also shown other signs of renewal. The old Railroad Station has been revamped and transformed into the Downeast Heritage Museum. Calais and the surrounding area is a nature lover’s paradise. There are rivers, bays, estuaries and over forty lakes that are preeminent locations for fly-fishing and recreation. Angling for Atlantic salmon is a popular pastime in the Calais region. Biking, hiking paddling and boating are as commonplace as hearing French being spoken. You cannot drive five miles without coming across a state park. Here is a closer look at some of the best outdoor venues. Billed as the International City of Maine, Calais has a unique range of dining options. From hip cafes to linen tabled restaurants, it all depends on how much money you want to spend. While traditional New England cuisine is as popular in Calais as the rest of Maine, why not go out on a limb? The Korean hangar, spiced red lentil and coconut soup, chicken with creamy tequila lime sauce, and catfish with chipotle are just a few of the selections you might find on the menu in Calais. While lodging in Calais is more sporadic than other Maine epicenters, there are still plenty of places to unpack your suitcase after a long drive. From ornate Victorian inns to traditional motels, you can find comfortable accommodations that serve breakfast, dinner and even have private balconies. The Calais region is often lovingly referred to as Sunrise County, and when you stand on your balcony in the early morning with a cup of Maine-roasted coffee in hand, you will see why. Up here, the sun rises early. Visit the following directories to find lodging, dining, attractions, shops, services and recreational activities in the Calais, Maine area.